UAJCA is grateful to Bradford & Bingley CC for allowing the UAJCA under-15s 2019 trials to be held at their outdoor nets. The trial will be held on the evening of Monday 13th May, commencing 6:00pm. Manager Adnaan Shafique will reveiew approx 28 potential candidates for a place in the 2019 squad. This year the younger u14 members of the squad will have a preparatory match against Indian visitors from New Delhi on the evening of 19th June at BIngley Congs CC [6:00pm]. The three group matches will be against Sheffield at Bradfield CC, at Earby CC versus Nidderdale and away [TBC] at Wetherby. WE will need to win all 3 matches for a place in the semi-final on 8th August. UAJCA should have a strong squad in a tough group including last year's winners Sheffield. 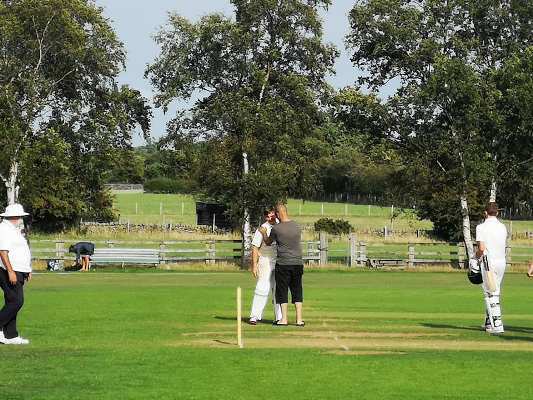 Earby in the sun was the venue for Wetherby's visit to UAJCA. Ollie Bishop won the toss for the first time and opted to bat. Openers Jack Luxton and Bradley Powell gave us a great start of 40 runs before Bradley was bowled by Sutton for 12 just after being struck by a throw-in from the field. Lewis Gardener was the new man and with Jack the pairing progressed serenely. At a score of 60-2 the loss of Lewis for a well-crafted 30 was tough. And it triggered a mini-collapse with the wickets of Shiv, Saqif and Toby all falling cheaply. But a real hammer blow was the run out of Jack Luxton who had mixed aggression and style on his way to 62 at 126-3. Now at 140-6 our cracking early start was faltering. But as yesterday Lucas Keslinke and Tom Eaglesfield created a stand that got the wheels back on. With 5 early boundaries, Lucas made 32 whilst Tom survived a catch off a no-ball. Peter Fishpool added 2 and then no 10 Saad Shafique rattled a quick-fire 24 whilst Tom remained the supporting batsman. The final tally was 220-8. The Wetherby bowlers toiled well with Dyson the pick with 2-26. Our bowlers kept the Wetherby batsmen at below 4 per over for a good deal of the match and the key wicket of Duggan was caught by Tom Eaglesfield from golden-arm Bradley Powell for 45. Tom in fact was a great candidate for man-of-the-match with 3-23 from 9 tidy overs. It was a day for the quicker bowlers and after Usman Riaz great efforts yesterday, today he went wicket-less for 31. Ollie picked up another scalp [White for 20] and Shiv Bhatoa late introduction allowed him 2-33 from 6 when the slog was on at the close. Wetherby never really got close as they never matched the run-rate. Wetherby ended at 201-8, 19 adrift. UAJCA now finish second behind Sheffield. UAJCA u15s faced Sheffield at a hot and sunny Crossflatts CC in the first Festival match of 2018. Some erratic bowling, dropped catches and poor fielding had us on the back foot as Sheffield openers Meadows and Goodhild made hay in a 138 stand. Number 3 Power continued their acceleration to record a third fifty for the Sheffield side, who finally tallied 219-3. The UAJCA batting suffered an early loss but a recovery began with Lewis Gardner and Toby Meynell. That took us to 40 but the loss of these two signalled a collapse and the Sheffield spinners enjoyed a good afternoon as UAJCA were bowled out for just 75. With a few changes to the line-up UAJCA made a better start at Beckwithshaw CC and with a superb 5-25 from Usman Riaz had Nidderdale at 129-8. But no 10 Cunningham wasn't about to give up and his farming of the strike and boundary hitting carried his team forward. Amazingly he scored 74 as last man out with his team on 221. The final two wickets had added 92 runs. UAJCA again lost an opener early in the response. But Jack Luxton and Bradley Powell combined well and a decent score began to take shape. Bradley was lbw for 33 but Jack continued with Saqif Ali after a second loss of Toby Meynell. Saqif's batting was a revelation but a big blow was the loss of Jack for a cracking 49. The wickets of Johnny Atherton and Bilaal Khan fell in succession and Lucas Keslinke joined Saqif, who went on to score 43 before being run out. Lucas then combined with Tom Eaglesfield and produced an over of 16 runs that got us back into the contest. Their stand proved just what the doctor ordered and the 38no from Lucas and 16no from Tom got us over the line with 1 ball to spare. It was a magnificent game of cricket with over 440 runs and 16 wickets. Nidderdale had played a great part but we now go to Earby to see if we can amass sufficient points to progress. Well done boys, fly the flag! Saqif Ali [GHC], Shiv Bhatoa [Oxenhope], Oliver Bishop [Oakworth], Luke Chapman [Earby], Peter Fishpool [Skipton], Lewis Gardner [Skipton], Lucas Keslinke [Oakworth], Bilaal Khan [Oakworth], Jack Luxton [Steeton], Toby Meynell [Bradley], Bradley Powell [Oakworth], Usman Riaz [GHC], Saad Shafique [GHC], Ben Southern [Skipton] & Jacob Terry [Cullingworth]. UAJCA under-15s will be at Home to a Sheffield team on Monday 6th August to start our 2018 challenge for the Yorkshire Festival. This will be followed by a trip to neighbours Nidderdale on Tuesday 7th August. A second Home match vs Wetherby at Earby CC brings the group matches to a conclusion on Wednesday 8th August. The semi-finals, should we qualify, will be held on Thursday 9th August, the Final on Friday 10th August. Please note all matches will start at 11:00am, earlier than in previous years. Despite bowling out the Bradford League for a modest 165, UAJCA batsmen were unable to capitalise and subsided to defeat at Keighley CC [after switch from Skipton CC] by 39 runs. Joe Bairstow [Oxenhope] and skipper Harris Rowlett [Steeton] led the batters whilst Lewis Gardner took the bowling plaudits [3-24] alongside the frugal Hasan Shakoor [Bfd & Bingley]. The scheduled matches at Skipton vs East Yorkshire and at Thongsbridge vs Huddersfield are CANCELLED due to waterlogged pitches. The return match at Skipton CC brought a win for UAJCA u14s and as expected more learning about the quality of the 'younger' of the u15 groups. Batting first UAJCA opened with Bradley Powell [Oakworth] and Tom Celik [Oxenhope]. Bradley made a solid 20 whilst Tom fell for 2. His club mate Shiv Bhatoa added 14 but we lost Toby Meynell[Bradley] also for 2. There was 9 from Tom Eaglesfield before the best partnership from Jack Luxton [25no] and skipper Lucas Keslinke . Our total of 104-6 wa perhaps only par. The Huddersfiedl innings followed a similar pattern but the introduction of Subhaan Ahmed and Hasnan Shakoor changed the pattern with Hasnaan claiming a terrific 5-19 from his 4 variable overs. Toby Meynell also impressed taking 1 wicket. It was a tense finish with the match going the full distance before UAJCA were confirmed winners by just 3 runs. Toby's final maiden proving vital. 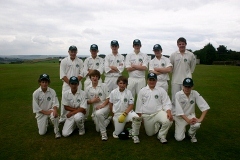 Neil Bishop took an u-14 side to Kirkheaton CC to play Huddersfield and learned much about this years crop of hopefuls. UAJCA batted first and scored 111 all out. Opener Ben Southern [Skipton] scored 14 as did Tom Celik [Oxenhope] whilst losing Tom Eaglescliff & Bradley Powell cheaply. under-13 Toby Meynell showed obvious class with is 27 in the middle order. Harry Bayliff [Embsay] and Ollie Bishop [Oakworth] added late runs with 15 and 16 respectively. For Huddersfield Mighall, Kenworthy & Lane each picked up 3 of our wickets. After 16 overs our bowlers were well on top with Huddersfield on 43-6, led by Ollie Bishop with 3-16 from 5 excellent overs. Fellow opening bowler Harry Rowe kept the lid on things conceding only 11 runs in his 5 overs. Saad Shafique kept the pressure on with 2-13 from 4 overs and at that point we were well in the driving seat. Huddersfield no 6 Mighall turned the tables with a series of attacking shots and his partnership with K Power . They added 67 runs in rapid time [13 overs] with Mighall ending on 49 not out as Huddersfield reached their target at 112-7 in the 29th over. Ben Holderness [Skipton] will again manage the UAJCA u15 squad. He will have assistance with the u14 element from Neil Bishop [Oakworth]. A trial match u14s vs u15s was held at Oakworth CC on Sunday 28th May. The u14s team to face Huddersfield at Kirkheaton CC on 11th June is announced as: Oliver Bishop [Oakworth], Ben Southern [Skipton], Tom Celik [Oxenhope], Bradley Powell [Oakworth], Toby Meynell [Bradley], Lucas Keslinke [Oakworth], Hasnan Shakoor [Bradford & Bingley], Harry Rowe [Steeton], Tom Eaglesfield [Bradley], Harry Bayliff [Embsay] & Saad Shafique [GHC]. UAJCA much awaited match-up with the Bradford Junior League was spoilt by the onset of the rain before and during the UAJCA innings. The Bradford League had posted 208-4 with a century going to their opener. UAJCA bowlers had toiled to dismiss the centurion, who struggled visibly to complete both his half-century and his three-figure mark. BJCL included former UAJCA players Joe Hall, Ben Hemsley and Sam Parry in their line-ups whilst UAJCA were as always home-grown including wicket-keeper Harris Rowlett [Steeton], who had returned from holiday earlier in the morning. Both sides had lost to Huddersfield earlier in the week, and they were now strong favourites to progress with East Yorkshire still to play. The UAJCA innings started well with early partnerships but a regular loss of wickets coupled with steady drizzle dragged our rate behind that of the BJCL, which induced the Umpires to berate the slow over-rate and finally limit the bowling to slower bowlers in the very poor light . Ultimately we tallied 152 all out and lost by 56 runs in conditions, which should not really have been tolerated. Elliot Wilson was top-scorer over the 3 matches with 124 including a belligerent 65 against East Yorks. Tom Starkey rattled 88 against Huddersfield for a tally of 110 whilst Adil Modak posted 87 runs in the 3 matches. Bowling-wise Ryan Hodgson stood out with 4-20 against East Yorks and 5 wickets in total, as did Adil. Ben reports a 62 run defeat at Steeton CC to Huddersfield. UAJCA responded with 216-7 to the visitors 278-6. The group will be settled tomorrow when UAJCA plays the Bradford League at Keighley CC whilst favourites Huddersfield will play East Yorkshire. Team Manager Ben Holderness announces his team for the 3-match Yorkshire Junior Cricket Festival. The team is James Robinson [Capt, Skipton], Adil Modak [Steeton], Tom Starkey [Skipton], Ryan Hodgson [U Wharfedale], Elliot Wilson [Silsden], Owen Narey [Steeton], Tom Meakin [Steeton], Bradley Gardner [Skipton], Harry Hollingsworth [Steeton] & Matty Corkindale [Steeton] plus one other to be confirmed. The first match is at distant but picturesque Londesborough Park CC against East Yorkshire on Monday 8th August [1:00pm]. The other two grop matches unfold on Tuesday and Wednesday much nearer home at Steeton CC and Keighley CC. The 2016 under-15s tilt at the Yorkshire Festival will be under the gaze and leadership of coach Ben Holdernness who led last year's u13s to the semi-final. His selection trial will be held at Denholme CC [provisional] on Sunday 10th July. This year our opposition will be East Yorkshire, Huddersfield and local rivals Bradford. Dom's boys with a number of players unavailable turned out with 10 men and have done UAJCA proud and gained an away win at Bedale CC against Hambleton JCA. The 181-7 score was led by 38 from Aatif Modak [Steeton], Hamzah Khan [Oakworth] and Josh Yates [Earby] with 38, 31 and 34 respectively. For Hambleton opener Zak Wilson did well with 40 but Cononley Ace Freddie Maddocks came up trumps with 3-19 in 6 overs to back up the 2-22 from Tom Meakin [Steeton] from 7 tidy overs. Using 8 bowlers Dom's lads contained well when the pressure was on. Now for Mirfield and the Heavy Woollen stars !! The last of our UAJCA squads is announced by Team Manager Dominic Bennett, following the trial on Friday 12th June. The Captain will be Tom Mawer [Oxenhope] and the squad includes: Cameron Knowles [w-k, Silsden], Nathan Storton [Oxenhope], Adil Modak, Aatif Modak & Tom Meakin [all Steeton], Freddie Maddocks [Cononley], Hamzah Khan [Oakworth], Sam Parry & Josh Yates [both Earby], Ben Hemsley [Bingley Congs], James Robinson [Bradley], Charlie Lawn [U Wharfedale]. The standby reserves will be Jack Downs [Embsay] and Lewie Fitton [Cononley]. The main squad has six new caps and 7 who have played representative cricket previously. It is likely that James Robinson may not be able to play all matches for as soon as he plays a competitive match for Yorkshire he becomes ineligible. A warm-up/practice match with Bradford is scheduled for 12th July at Keighley CC [2:00pm]. After a terrific win at Embsay hopes were high of a semi-final but first UAJCA had to overcome Heavy Woollen District at overcast Gomersal. An opening partnership of 22 was dominated by UAJCA skipper Elliot Stockton who made 18 before he was put lbw to Collins. Yesterday's heroes Tom Mawer and Billy Whitford were re-united and again the pair blended superbly if a little more slowly. Tom was bowled by Isles for 20 in 23rd over with our score on 67 for 2. The innings seemed to be following more the pattern of Monday at Fishlake than at Embsay. Ben Hulse who had looked threatening in both previous matches made 13 before falling to Isles at 87 for 3 in the 34th over. Billy remained at the wicket but in more subdued mode whilst Nick Firth attacked as usual making 10 before becoming Isles third victim. 99 for 4 in the 36th over might enable UAJCA to tally around 150 but there was still more work to do to reach even that. Sam Mitchell and Tom Addison each troubled the scorer for a single to leave UAJCA at 110-6. Sam Barraclough had barely been used till today and he grabbed his chance making 15 in partnerships with Billy and Ben Sugden. Injured Jacob Jagger, a half-centurion at Fishlake, made 11 not out as UAJCA ended their knock on 152 for 8. Isles claimed a restraining 9-1-14-3 with 2 each for Collins and Senior. A first wicket stand of 31 from HWD came in just under 4 overs and the whirlwind opening had UAJCA on the back foot. The stand was broken by Nick Firth with an lbw dismissal of Smith for 8. 6 runs later no 3 Hewlett was another lbw victim to the speedy Firth. No 4 Senior settle with Brooke and the pairing posted another 38 runs to the HWD tally. Brooke was run out by the lurking Sam Mitchell for 31 to end their progress in the 12th over. No 5 Collins also settle quickly with Senior, who was next to depart for a really significant 42 at 103 for 4. UAJCA needed to continue to take wickets as the HWD run-rate was way ahead of their early stanza. The 'killer' innings came from Dennison who steered Collins 25 at 147 for 5 after 25 overs. Collins fell to Matt Daggett as did Dennison also for 25 on the same 147 score. The match was finished off by A Hussain with 9 no and HWD won by 4 wickets. For UAJCA Firth returned 5-0-32-1 and Daggett 5.5-0-34-2. So the semi-final was not reached in a disappointing finish after the heroics at Embsay. But to quote the cliche there were many positives to emerge; the all-round skills of Firth and Sugden, the batting of Jagger, Whitford and, Mawer and the consistent bowling of Daggett. The skipper was below par but was carrying a back injury. Mitchell and Mawer will be around for 2015 and should provide the experience for another tilt with hopefully more consistency from both batting and bowling. The Continued fine temperatures at Embsay CC enabled an excellent crowd to enjoy some more entertaining cricket. This time visitors Nidderdale would bat first. UAJCA made an early breakthrough with the wicket of Webster , bowled by speedy Nick Firth from the Shires Lane end. More joy followed in the next over at 9 for 2 as Matt clean bowled Cutts for a duck. If it could be scripted another 2 wickets would set us on our way and Nick obliged with the scalps of Giddings  and Torrence  to leave Nidderdale in dire straits at 18 for 4. Opener Witham was still at the crease, now with no 6 Winter-Halder. The rebuild began with Nick on 3 for 9 off 3 overs. He stood down after 6-1-18-3 with Matt also replaced on 4-1-19-1. The 5th wicket added 36 runs in 9 overs but the stand was broken by Ben Sugden via a Sam Mitchell catch to dismiss Winter-Halder for 12 at 54 for 5. Number 7 Robinson dug in deep and Witham began to began to dominate. They stayed together for 15 overs adding 51 runs to the Nidderdale challeng. Witham fell in Nick Firth''s return over caught by Sam Barraclough [Skipton] for a fine 51 [6 fours and a six]. The score was 105 for 6 with 16 overs remaining. There the hitherto UAJCA dominance faded with a counter-attack from Nidderdale. Robinson and no 8 Mann took up the cause and added 44 on 8 overs, Mann falling for 27 to Ben Sugden. But their resistance didn't end there as the 8th wicket added another 45 in only 6 overs before Robinson was caught by keeper illy Whitford [Cullingworth] for Sam Mitchell for a sterling 37. The Nidderdale innings closed on 198 all out, afar cry from the 18 for 4 they found themselves in 2 hours earlier. Nick Firth bowled out with 9-2-28-4 with 2 each for Daggett, Sugden and Mitchell. In the third over the UACA innings skipper Stockton was caught for 4 at 7 for 1from the bowling of T Mann. Billy was joined by Tom Mawer to try and avoid a start like that of Nidderdale. The fifty mark came up at the end of the 15th over as the two embarked on a stay together. As they settled and blossomed they approached a three-figure stand in exemplary manner. Billy was given a life which helped but the partnership went on and on. At the end of the 34th over UAJCA stood at 141 for 1 and a comfortable win was on the cards, although 58 was still needed from the remaining 11 overs. The 25th over by off-spinner T Stark finally broke through Billy's defence when he misjudged the spin and was lbw for 71. Tom now joined by Ben Hulse [Settle] hit 2 fours after a bye and then but then Stark accounted for Ben given lbw and Nick Firth bowled in successive balls. The over ended at 146-4. 9 overs remained to get 53, so who was favourite now? Tom Mawer was batting superbly finding the gaps through the off-side, inducing the Nidderdale skipper to employ a 6-3 split. Sam Mitchell settled some of the nerves adding 11 to the stand of 26 with Tom before he was bowled by opener Mann. 168 for 5, 6 overs left to score another 31, a slightly better equation. It was the addition of Ben Sugden which proved decisive as he remained defiant with Tom adding 29 in 5 overs. Ben was bowled by Mann for 9 but our score had reached 197 for 6 with 4 balls left to score 2 runs. They came up fittingly from Tom with 1 to spare. Phew. 199 for 6 was a terrific effort with the accolade rightly going to Tom for an unbeaten 86 to sit alongside the quality innings of 71 from Billy. Mann concluded with 7.5-1-26-3 and spinner Stark 9-0-48-3. So it was one win each and all to play for against Heavy Woollen District at Gomersal tomorrow. The 2015 under-15 Festival got underway in excellent weather and UAJCA first match was at the picturesque Fishlake CC, resplendent in the sunshine. UAJCA skipper Elliot Stockton [Embsay] won the toss and elected to bat. Our openers were Jacob Jagger [Wilsden[ and Ben Sugden [Silsden] and they proved a fine a combination. Both stared well, taking the initial sting from the Doncaster opening bowlers Matthews and Critchley. Their caution was exemplary but gradually the bowlers got on top and by the 20th over UJCA had just 40 on the tins. Jacob had 4 boundaries but became becalmed whilst Ben too faded after a bright start. He was the first to fall  with our score at 65-1 but with 24 overs already bowled. Skipper Elliot started in aggressive mode but on 8 received an lbw decision for a ball which appeared to hit him high on the thigh. At 78-2 Silden' Nick Firth quickly set about raising the run-rate in imperious style. Jacob settled for the support role and the pair added another 38 runs. Jacob was caught by Matthews from the bowling of 3rd change Colley, a lad who had scuppered our Joe Lumb Cup quest with 6 for 28 at Skipton in June. Jacob took the applause for a gutsy 51 innings. Sadly for UAJCA this was immediately followed by a golden duck for Sam Mitchell. Nick had galvanised the approach but on 36 [5 fours] he was caught by Morris for Matthews at 126 for 5. If Nick's rate could have continued perhaps 175 might have been attainable and Ben Hulse made a good start on that thesis. But Tom Mawer departed for 5 singles and Matt Daggett copped our second duck, both to the second Matthews spell. Tom Addison joined Ben, who looked secure. They added 23 before Ben was run out by a direct hit for 14. Our 45 overs came up with 154 for 8 our posting. Matthews finished with 3 for 24 whilst Colley also had 3 for 36. UAJCA needed a top bowling performance to defend the below-par score but 3 wides in the first over from Matt Daggett didn't augur well. But the reward for tightening up came in the ninth over as he induced the edge to keeper Jagger and Woodiwiss was on his way for 5 at 31-1. Fellow opener Nick Firth took a leaf from Matt's book and took a second with addition to the score with Thompson dismissed in the same manner for 18; 31 for 2. Colley came in at no 4 and took over scoring responsibilities, carrying the Doncaster tally to 67in the 16th over when he lost partner Horris for just 8, bowled by Nathan Storton in an over which had had 2 wides. The pivotal partnership then unfolded between Colley and Yeaman, the pair adding 59 runs in 10 overs. Colley was the key and a narrow run-out decision went against UAJCA as the Doncaster boys approached their target. Yeaman was bowled by Ben Sugden for 28 in an impressive 4-over spell, but at 126-4 in the 26th over it was likely too little too late. There was a bonus when Kirkham was given out lbw when he was on 2 to a ball he clearly hit. Doncaster no 7 Fisher put bat to ball and his rapid 18no supported Colley to a fine fifty [57no] and Doncaster reached 156 for 5 in the 34th over. Our score of 154 was at least 30 or 40 short and our bowling had proved mixed with good returns for Daggett [1 for 16 off 6 overs], Sugden [1 for 12 off 4] and Mawer [1 for 30 off 9] but the rest were inconsistent in amid-innings spell of 6 overs which cost 54 runs. The ridiculous rules of the Yorkshire Junior Cricket Festival have conspired to prevent our boys from progressing to the semi-finals as their second terrific win [against much vaunted Heavy Woollen] demanded. The rules do not take account of wickets lost or how many runs opposition sides are limited to. Essentially the rules favour a team batting first and do not allow further bonus points beyond the total the team batting first has posted. All this is of course minute detail and UAJCA will be putting forward proposals to revise the regulations for future years so that the prestige of the competition is not again jeopardised. UAJCA bowled and fielded superbly in containing and dismissing Heavy Woollen batsmen. Elliot Stockton and John Davidson each took two wickets with one each to Matt Wear and Ben Jagger and one run out. UAJCA u-15s have gained a first win against Nidderdale JCA by a comprehensive 76 runs. UAJCA scored 229-4 led by George Heartfield [Cullingworth] 93 with 40+ scores from Dan Scott and Lewis Hopkinson [both Oxenhope]. After the rain-off on Monday at Settle UAJCA now head for Denholme to play Heavy Woollen. A semi-final beckons at Stamford Bridge. Possible opponents would be Huddersfield or York. Our u-15 bowlers performed so well at sunny Earby CC against opponents Aire-Wharfe. The Aire-Wharfe boys were held at 124 all out and left UAJCA with a great chance of reaching the semi-finals. But it wasn't to be as the Aire-Wharfe spinners undermined our batsmen who ended 58 all out. Results from Tuesday showed that we have all to play for in the YJCF as Sheffield defeated Aire-Wharfe. This means that all four teams have won one and lost one match. The result was Sheffield 169-6, Aire-Wharfe 105-6. A win today over Aire-Wharfe at Earby CC could possibly see us through to the semi-final, although both Sheffield and Huddersfield have a similar chance. Our high losing score yesterday may well be of great help. A visit to the vast Broad Oak ground was greeted with wetness but eventually a 35-overs aside match was bathed in sunshine. The Huddersfield innings featured twin brothers who both play for Yorkshire, the elder making 106 not out in a 219-3 tally. Our bowlers toiled well with Isaac Murray [Denholme] the most successful with a brace. With the bat a run-out for skipper Ben Howell [Oakworth] off a no-ball didn't help but a great stand from Isaac and George Sutcliffe [Skipton] not only accumulated but got us up with the run-rate. Isaac scored 25 and George an attacking 56 from only 53 balls. Oakworth' Jack Keighley took up the mantle but steadily lost partners, finishing on 43 in our 178 all out total. It was a defeat but with all to play for tomorrow vs Aire-Wharfe, who have wins over out u-17s 7 u-13s this year. On an extremely hot and humid day Aire-Wharfe u15s set off at a 7 per over rate as our quicker bowlers toiled in the heat. Mid-innings intervention by Ben Addison (Oxenhope) with 3 wickets and slow bowling from George Sutcliffe (Skipton) and Alex Horsfield (Glusburn) changed the perspective considerably and after dismissal of excellent openers the rate slowed markedly. Aire-Wharfe score did though pick up well towards the end to reach 229-7. Our innings start was hampered by early loss of Ben Whitfield (Wilsden) but George Sutcliffe (Skipton) and Callum Lockett (U Wharfedale) swifly set the electronics in motion despite the swarm of wasps! After in-form George was caught for 25, Callum and club-mate [Captain] Kyran Clarke continued the rapid assault on three figures before disaster struck. In attempting a second run Callum turned to regain his ground but slipped and was stranded mid-wicket to be run out by the Aire-Wharfe keeper. He had made a classy 34 in only 9 overs. Kyran held things together whilst Izaak Beck (Skipton) put in the big hits to take us well past 100. His loss brought in Luke Hipgrave (Earby) and the momentum was well maintained. The loss of Kyran was a heavy blow but Ben Howell (Settle) helped his partner recoup. We were starting to slip a little behind the rate required and the added pressure told with the loss of Ben. Charlie Shimmin (Haworth WE) partnered Luke well and the Earby lad began to pierce the field and find more and more gaps. The last over was reached with a daunting 16 needed but whilst they did their best we fell 9 short of the Aire-Wharfe target. But credit the Aire-Wharfe bowlers who tightened their grip and finally saw their team home in a well-conducted and evenly contested match. So UAJCA completed the tough three matches in three days programme without a win but oh how well they competed. With a little luck all 3 matches could have been won. A dropped catch at Oakworth, a run out at Earby and a slip and a couple of close decisions at Otley. A positive benefit has been that as many 'senior' year boys were unavailable due to holidays UAJCA blooded a number of u14s and George Sutcliffe, Luke Hipgrave, Charlie Shimmin, Alex Horsfield, Ben Howell and Will Grafton will all be better prepared for 2012 should they be selected. UAJCA welcomed back Callum Lockett from broken toe injury and he galvanised our batting with a classy 91 before skying a slower ball. Wharfedale team-mate and UAJCA Captain Kyran Clarke shared a brilliant partnership with Callum, making 41. The 178-6 final total looked healthy after a score-line of 32-2 off 20 overs. Our bowlers were magnificent taking out a skillfull Huddersfield top order with Jack Roberts (Glusburn) again the main striker with 4 for 16 from 6 overs. Carl Tetley of Gargrave combined well with Jack to strangle the middle order, his figures 5-1-8-1. Alex Hosrfield (Glusburn) too kept the visitors in check with his lefty chinamen. Ben Whitfield (Wilsden) also bowled with effect at the death. The winning runs came from Huddersfield's Alex Clegg on 28no with a reverse sweep off Ben. But what a match, a real battle, just going away from us at the close. We are really relishing the match with Aire-Wharfe at Otley CC. 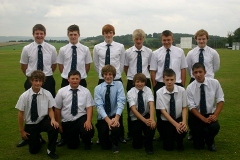 UAJCA u15 Taverners suffered defeat to Sheffield JCA in the first match of the Yorkshire Junior Cricket Festival. Sheffield won the toss and opted to bat. From an excellent start for UAJCA with 4 wickets bagged for 73, a Sheffield middle-order batsman scored 132 to lead his side to 256-7 with 27 from the last over. For UAJCA Jack Roberts of Glusburn took 5 for 39 in his nine overs and the left-arm slow bowling of Ollie Huck (Oakworth) brought him 1-17 off nine overs. UAJCA batting was led by George Sutcliffe (Skipton) with 57. UAJCA were well in contention having a great start at 80 for the first wicket. The last 15 overs saw our innings decline to 172 all out. Fuller report to follow. Upper Airedale clothing sponsor Dobson & Robinson have revealed the new kit for our representative teams in 2011. 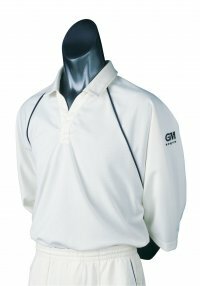 The shirts (pictured) will be supplied by Gunn & Moore. 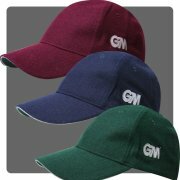 All teams will receive sweaters, caps (also pictured) and shirts, badged with UAJCA logo, on confirmation of selection for the final squads of 15 after the forthcoming trials.